• S&P 500 Nears Record High. Stocks ended a strong week, with the S&P 500 posting gains for a seventh straight session, its longest uninterrupted winning streak since October 2017. Positive sentiment prevailed the entire week, boosted by rejuvenated jobs growth and accelerating optimism for a trade deal with China. The S&P 500 posted its fifth week of 2% or greater gains this year. • Weekly Performance. For the week, the S&P 500 gained 2.09%, the Dow Industrials rose 1.91% and the tech-heavy Nasdaq Composite surged 2.73%. The S&P 500 narrowed the gap from its September 20, 2018 all-time high to 0.46% from 2.3% the prior week. • Robust March Jobs Data. U.S. employers added 196,000 new jobs last month, topping projections, while February’s tepid increase was revised higher (33,000 vs. 20,000). The unemployment rate was unchanged at 3.8%. • Materials Performed Best. Nine of the 11 major sectors posted weekly gains, led by Materials (+4.25%), Financials (+3.42%) and Consumer Discretionary (+3.23%). Healthcare (+0.29%) rose the least, while Consumer Staples (-1.03%) and Utilities (-0.15%) lagged. • Treasury Yields Rise. Treasurys fell last week, sending the yield on 10-year notes up nine basis points to end at 2.496%. The U.S. Dollar Index strengthened by 0.11% last week, while West Texas crude oil surged 4.89% to $63.08/barrel. Friday, April 12: Import & Export Prices, Consumer Sentiment. Jobs growth rebounded in March after a disappointing labor report in February. The U.S. economy added 196,000 jobs, ahead of expectations of 175,000, and well ahead of February's 33,000 gain in nonfarm payrolls. The unemployment rate held steady at 3.8% and YoY wage growth fell narrowly from 3.4% in February to 3.2% in March. 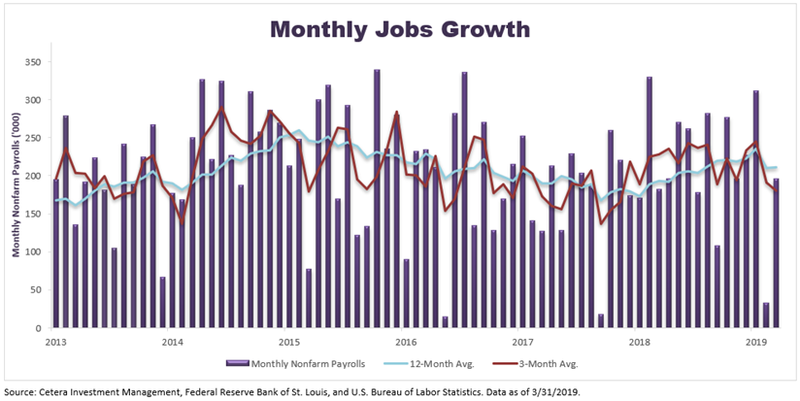 The March labor market report is encouraging and points to a continuation of solid growth for the U.S. economy.